Linking gum wrappers is an unusual craft. Creating gum wrapper chains is a fad that started in Canada in the 1960s. However, nearly a half-century later, it is still as popular as ever -- even permitting one man to make it into the Guinness World Records by having the longest chain of gum wrappers to date. Similar to candy wrapper crafts, creating projects out of gum wrappers is a great way to recycle what otherwise would have been thrown away. This project uses discarded chewing gum wrappers that are folded and linked together to make a chain. No tools or adhesives are needed. Imagine spending 45 years on a single craft with its end result being a project that makes into the record books. That's what happened to Virginia Beach, Virginia, resident Gary Duschl. On March 11, 1965, he began making a chain using only Wrigley chewing gum wrappers. 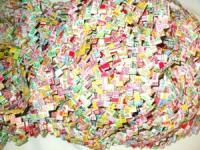 On March 11, 2010, he had created a chain contained 1.5 million gum wrappers (roughly 3 million links). It was 12 miles long and weighed 882 pounds. It was the length of 211 football fields. Duschl estimated that this project took him 24,000 hours and used about $105,000 worth of gum. His goal is to keep building the chain until it reaches 26.2 miles, the same length as a marathon. Collect as many different stick gum wrappers as you can. The more variety you have, the more colorful the chain will be. Open the wrapper and place it vertically on a flat surface. Fold it in half horizontally and carefully tear it into two pieces. Some people tear it into four horizontal strips for a thinner chain. Crease the first piece of the wrapper in half lengthwise. Open it up and fold each edge toward the center. Fold it in half lengthwise again so you have one thin piece of gum wrapper. Take both ends and fold them in toward the center until it creates a "prong." Repeat these steps with another torn piece or pieces. Slide the "prongs" of the gum wrapper into the tabs created by the first wrapper. Continue to do this until a chain is made. Make napkin rings by making smaller chains and connecting the ends together with tape or glue. If you are really adventurous, try your hand at making a dress out of gum wrappers like this teen did for her prom. Take some time and weave yourself a gum wrapper purse. Flickr has an abundance of gum wrapper craft images for you to peruse, including a TV tray and umbrella.